Erie, PA, January 26, 2017 --(PR.com)-- Free To Choose Media (FTCM), an award-winning television documentary film production company, today announced that Cato Senior Fellow Johan Norberg has joined the organization as executive editor. Norberg, who has hosted numerous FTCM documentaries for public television and FTCM’s Dead Wrong® online series, moves into the newly created position immediately. Described as “a glamorous young pro-capitalist” by Washington Post, Norberg is the author and editor of more than 15 books, including Progress: Ten Reasons to Look Forward to the Future, named by the Economist as one of the best books of 2016; Financial Fiasco: How America’s Infatuation with Homeownership and Easy Money Created the Economic Crisis, which inspired an internationally acclaimed documentary; and In Defense of Global Capitalism, originally published in Swedish in 2001 and since published in more than twenty countries. Norberg has hosted a number of FTCM documentaries, including The Real Adam Smith, an exploration of the “father of modern economics”; Trailblazers: The New Zealand Story, releasing to public television stations on January 28; and Is America in Retreat?, a companion documentary to Pulitzer Prize-winning Wall Street Journal columnist Bret Stephens’ book, releasing March 24. 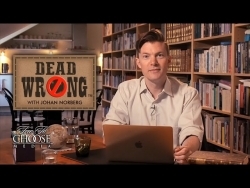 As executive editor, Norberg will continue to host documentaries, produce his weekly online series, Dead Wrong, and help produce additional projects, illuminating complex international and domestic issues and subjects. In addition to his work with Free To Choose, Norberg pens a weekly column in Metro, Sweden’s leading newspaper, and his articles and op-eds are featured regularly in many of the world’s most influential news outlets, including The Wall Street Journal, The Huffington Post, National Interest, Forbes, and The Spectator. Based in Erie, PA, Free to Choose Media produces thought-provoking, award-winning, public television programs and series, offering diverse voices, powerful stories and a fresh perspective on a range of important global and national issues. For more than 30 years, the Free To Choose production teams have traveled the world to explore topics such as the economic roots of the Arab Spring and the inspiring stories of entrepreneurs raising themselves and their communities out of poverty, as well as revealing how innovation and new technologies may be the answer to the world’s growing energy needs. For more information, visit the website, at www.FreeToChooseMedia.org.